“Takings” is a legal concept derived from the Fifth Amendment of the U.S. Constitution. It comes from the final clause: “nor shall private property be taken for public use, without just compensation.” Originating in English common law, this phrase recognizes that government at times has an obligation to take property, but such a taking must be for obvious public use and the owner or owners must be paid a fair price. As with the rest of the first ten amendments that make up the Bill of Rights, it is intended to prevent government tyranny over the individual. Since the founding of the nation, takings traditionally were restricted to such obvious needs as highways, then gradually expanded to such things as airports and access rights for utility lines. In more recent years, governments have used this seizure right (eminent domain) to seize land and buildings for urban renewal projects, although this has created considerable legal controversy. Another use began to evolve in the management of floodplains, as governments wrestled with the adverse impact that new construction has on flooding. During floods this construction, typically for businesses and housing but sometimes for government projects, can increase the flow of water onto neighboring lands or shift it into previously flood-free areas. In addition, concrete and other paving exacerbates flooding by decreasing the ability of heavy rain and/or floodwater to sink into the ground. Because of this, in the latter years of the twentieth century and into the twenty-first, governments at all levels found themselves in a dilemma. If they denied a development in the floodplain, or severely restricted it because of anticipated flood problems, the developer could sue, claiming his property rights were being taken without just compensation; if the courts agreed, the government could be ordered to pay the developer a hefty sum of money. But if government permitted a development that caused increased flood damage for other properties, those owners could sue, claiming that the government had infringed on the use of their property. What to do? And how does one protect not just the floodplain but, when millions of dollars are spent on flood-control projects, how do you assure that these projects are not undermined by later development, causing huge financial losses across the affected area? Compounding this dilemma was the persistent urge of officials everywhere to support expansion and growth as almost an unqualified obligation, with little or insufficient regard to its negative impacts. 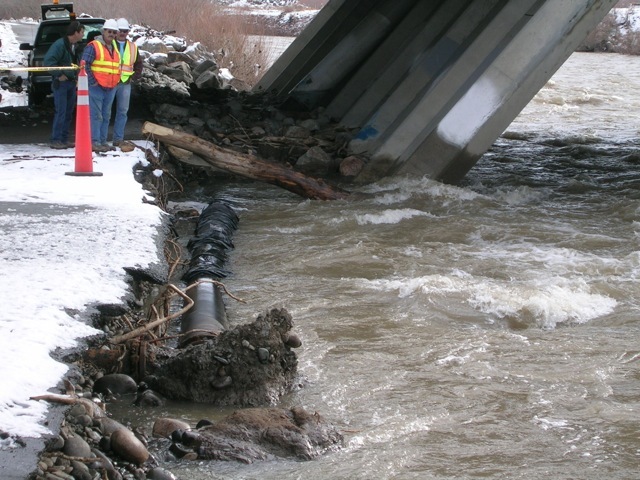 To address this issue for the Truckee River Flood Management Project, nationally recognized floodplain manager Edward A. Thomas presented a takings seminar in February 2008 in Reno, Nevada. He explained that governments could institute floodplain regulations and have them upheld in court if they relied on the “no adverse impact” standard—the common-law concept that no one can use his land in such a way that it harms other properties: in this case, increase their flood damage and soil erosion. The courts had been shifting in this direction for some time, he said, moving the nation in a different direction from the property-rights concept embodied in the 1922 Pennsylvania Coal Company case. In that instance, the United States Supreme Court ruled that the state of Pennsylvania had acted unconstitutionally in passing a law that forbade underground mining that would injure houses on the surface; in doing this, it said, the state had engaged in an improper taking. But in 1987, as one indication of changing times, in the Keystone Coal case the high court said a state could legally enact a law protecting the community as a whole, and there would be no taking. As to government liability for not preventing floodplain encroachment and damage, court rulings were clear. For instance, in a 1980 lawsuit against Clark County, Nevada, the county was found liable for flood damage caused by its approval of a subdivision. In 2007, the City of Half Moon Bay, California, was found liable for $37,000,000 for building a storm-water drainage system that caused flooding. Also in 2007, the District Court of Lancaster County, Nebraska, found the city of Lincoln liable for flood damage to homeowners who had been issued building permits without being told they were in an area identified by the state as a special flood hazard (the city had mislaid the state’s information); judge Steven Burns said city employees had been negligent and the city had ignored a specific duty to utilize the information. In addition to such cases, courts could find governments liable for bridges that lacked adequate openings, for blocking a watercourse, and—most important in regard to floodplain control—issuing permits for developments that harmed a third party. This would indicate that government not only could but should regulate private development in the floodplain. But it had to do so carefully. To make no-adverse-impact work, all the impacts of a proposed development had to be identified. All affected properties also had to be identified. All potentially affected persons had to be notified. The developer had to be permitted to redesign his project. Appropriate mitigation measures had to be mandated. Of course, this required a government to have the ability to accurately predict adverse impacts. This might involve not just the ability to predict the impact of one development but of several developments that individually might have little adverse effect but that as a group would worsen flooding. Developers could argue that the government maps and data were wrong, especially in predicting the impact of multiple construction projects, but governments could take comfort in the fact that forensic hydrology had improved markedly. Even so, governments intending to enforce floodplain regulations had to be prepared for a tough fight. This would include, at the outset, “bluster and threats,” followed by the argument that the government had deprived the developer of his constitutional rights under the color of law, and, this argument failing, that the developer had been singled out for unfair treatment due to personal animus or other inappropriate factors. These latter two arguments relied on Title 42, § 1983 of the U.S. Code, which was adopted by Congress in 1871 to reign in the Ku Klux Klan but was resurrected in 1961 by the Supreme Court in a broader property-rights context. In one such case, the court told the state of California that it must assure comparable replacement housing before displacing homeowners for a highway. And in a 1989 ruling, the high court said a city could be held liable for failing to properly train its employees. Another complexity involved construction that would not endanger nearby properties but only the property where the construction was contemplated; in pursuing his project, the developer could argue that government was overreaching in trying to protect him against himself—although a government could argue in return that such laws existed (seat belts and motorcycle helmets, for instance), and that someone buying the property later might not be aware of the risk.